Let’s hear it for modern medicine! Never before was humanity able to cure diseases, repair injuries and significantly prolong life to the extent it can today. Despite this fact – or precisely because of it – we’ve pretty much distanced ourselves from almost everything our forefathers have achieved to alleviate and cure physical maladies. Thank heavens one might think, considering traditional treatments including herbal elixirs, the universal weapon of cod liver oil or sawing open the top of skulls due to depression or any other emotional instability. Nowadays, we swallow antibiotics, correct or replace faulty parts and by doing so we’re inhibiting our body’s ability to heal itself. But in fact, our body is capable of amazing things and sometimes we just get in the way with all of our remedies and ad hoc solutions. To heal also means to build a foundation for health, well-being, strength and energy. There is a difference between feeling sick and actually feeling healthy and vigorous. 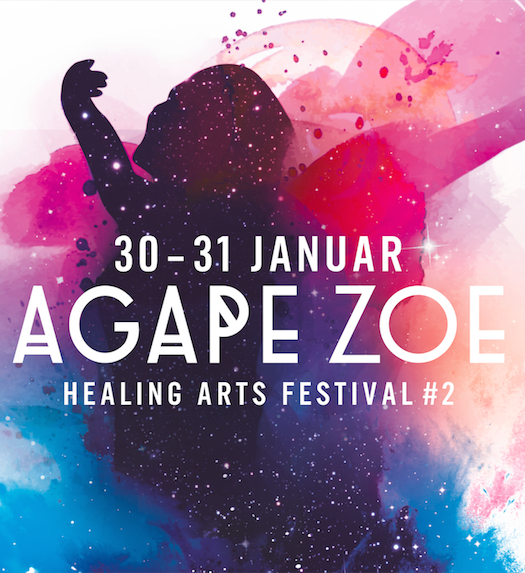 This is exactly where the Agape Zoe Healing Arts Festival, which is taking place for the second time in Berlin this weekend, comes in. More than 30 international „healing artists“ such as massage specialists, meditation gurus, yogis and osteopaths invite visitors to explore modern alternative healing practices for body, mind and soul. Ancient healing arts are transported into a contemporary context and interweaved with modern disciplines, such as, for example combining yin yoga with sound healing. This generates synergies and encourages visitors to try new methods and integrate them into their daily lives. Therapists will practise and demonstrate the Grindberg Method, osteopathy, Theta Healing, holistic bodywork and massages on the „Healing Floor.“ The „Silence Healing Room“ offers dynamic breathing and healing meditation in small groups. Highlights include a „Soulful Piano Journey“ with pianist Laura Weider, who once made it into the Guinness Book of World Records by playing a 40 hour solo piano set (! ), a Thai-massage-workshop with Pascal Beaumart, the LOMI LOMI SISTERS with their Four Hands Hawaiian Massage, and festival founder Serap Kara’s Cacao Meditation. Day tickets are 39 Euros apiece, festival tickets for both days are available here for 59 Euros: send an email titled HEALING IS THE NEW YOGA to hurra@muxmaeuschenwild.de.